A new study published in Jama Pediatrics[i] claims that babies given solid food in addition to breastmilk from three months of age sleep better than those who are solely breastfed. Mothers filled in monthly online questionnaires between three and 12 months, and then reported quarterly until their children were three years old. Those who were giving solids reported that babies slept longer (a peak difference of 16.6 extra minutes per night at around six months), woke less frequently (1.74 times a night instead of twice a night) and had fewer serious sleep problems than those who were exclusively breastfed until about six months. The mothers also said they had improved quality of life. LLLGB aims to provide mothers with accurate information about breastfeeding and parenting to enable them to make informed choices and consider what is best for them and their families. The JAMA Pediatrics study raises several areas of concern. Breastmilk is easily digested and is meant to be absorbed quickly by a baby’s digestive system. Waking to nurse frequently is a protective measure to help prevent a life-threatening sleep apnoea (a temporary inability to breathe), as infants who spend more time in a deeper sleep don’t arouse so easily. Breastmilk supplies all the essential nutrients a baby needs for around the first six months of life. An infant’s digestive system is designed to be ready for solid food once he has developed enough to be able to eat it on his own. A baby’s digestive tract needs to be mature before starting solids, so the lining of his intestines is sealed against allergens (allergy producers). If given solids too early, allergens can slip through the intestinal wall into the bloodstream, resulting in the baby producing antibodies against them, potentially leading to allergies and eczema. Often a baby will automatically thrust solids back out to protect his digestive tract. In addition, starting a baby on solids like fruit and vegetables before he is ready can cause his iron stores to drop. This is because these foods are often low in iron and so are simply replacing breastmilk, the perfect food for babies, with ones providing fewer nutrients. 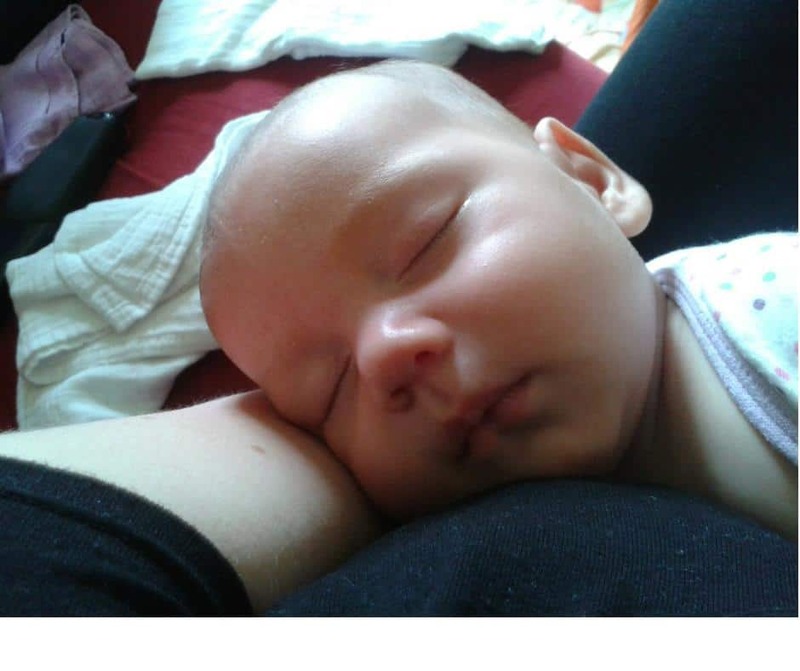 Frequent night waking to breastfeed poses a significant challenge to mother’s sleep; however, feeding a baby solids before he’s ready in the hope that he will sleep more could over-ride his instinct to wake and could create other problems. Caring for a new baby is often tiring, independent of the way a baby is fed. It can help to try to sleep or rest when the baby does, even if it’s not a time when you would normally nap. Sitting down to breastfeed means you get a chance to relax and put your feet up. La Leche League GB knows that women often receive conflicting advice and information. While we recognise that it is important to ensure that recommendations are based on the best available evidence and are regularly reviewed, we continue to believe that breastmilk provides everything a baby needs up to around six months of age, and that introducing other foods before a baby is ready is not beneficial. Babies’ individual development varies and parents are best placed to look for signs that their baby may be ready for solid foods. [vii] La Leche League International. The Womanly Art of Breastfeeding. 2010, 8th Edition; 248-249. [ix] American Academy of Pediatrics. Starting Solids Too Early May Increase Obesity Risk, https://www.aap.org/en-us/about-the-aap/aap-press-room/pages/Starting-Solids-Too-Early-May-Increase-Obesity-Risk.aspx (accessed 9 july 2018).